Dubai-based Emirates Global Aluminium (EGA) and the Austrian company Hertwich Engineering (HE) recently celebrated the 25th anniversary of their partnership. 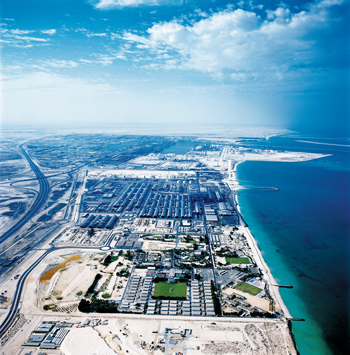 Since starting production in 1979, Dubai Aluminium (Dubal), now an operating subsidiary of EGA and referred to as EGA Jebel Ali, has become one of the world’s largest producers of primary aluminium with capacity in excess of one million tonnes per annum. Together with Emirates Aluminium (Emal), another EGA subsidiary referred to as EGA Al Taweelah, EGA today has a production capacity of around 2.4 million tonnes per annum, ranking the business among the five largest primary aluminium producers in the world. Achieving such a high quality standard requires a series of selective measures for preparing the hot molten aluminium and cast billets for the subsequent extrusion and forging processes. The equipment and technologies required for this are the field of HE. In the business sector of melting, heat treatment and recycling technology of aluminium, HE is today the technology and market leader. This success in the special sector of extrusion and forging pre-material production is largely attributable to the company’s collaboration with EGA Jebel Ali. In its search for new and better systems HE has developed innovative and sometimes revolutionary technologies. However, for these to become established on the world market, reference plants were needed where the technologies’ capabilities could be demonstrated on an industrial scale. HE found such a partner in EGA Jebel Ali. For starters, EGA Jebel Ali was the first smelter complex in the Middle East to use the completely new HE continuous furnaces for heat treatment (known as homogenisation), together with a 100 per cent ultrasonic inspection system and two sawing machines. The HE heat treatment technology yields exceptional material quality, without any internal defects and with outstanding uniformity of the properties over the full length of the extruded sections. Based on this proven success, the HE process is today used for around 60 per cent of all billets for extrusion and forging produced worldwide. At present EGA’s subsidiaries operate a total of six homogenising lines of this type. However, continuous homogenising technology is not appropriate for every purpose in producing billets for extrusion and forging, and the conventional (batch) method remains indispensable. To achieve the same standards with conventional technology, HE has also developed a new furnace concept. Here again, the cooperation partner was EGA Jebel Ali, which was the first smelter complex to install and use the new technology. Its performance capabilities have since been fully demonstrated.